This is a workshop for the beginner-level mosaic artist interested in taking mosaic beyond simple craft projects to an intermediate level. The instructor will present the fundamentals of mosaic, explaining terms like "tesserae," "andamento" and "sdoppiamento." We will explore basic concepts required to control the direction and flow of mosaic, which can define the energy of the artwork. This workshop will include a powerpoint presentation demonstrating various approaches, hands-on exercises to practice cutting and placing pieces into various patterns, and handouts to take home. Jennifer Kuhns has been creating mosaic for 18 years. Her work ranges from strikingly realistic to highly designed tile installations. She has been featured in many exhibits and galleries throughout the country and works with salvaged glass, tile and other reclaimed materials, painstakingly shaping each piece for assemblage into exquisite mosaic art. 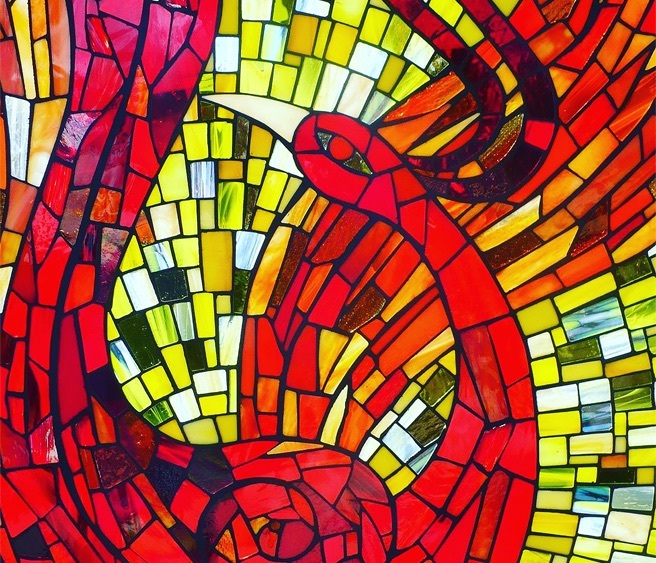 She creates custom mosaic for corporate and private clients, and her public art and community projects demonstrate a rare ability to engage, educate and create community with all ages and socio-economic groups. She lives and works on a small farm in rural western Washington. welcome to bring them as well.